Once winter passes and you're enjoying bright summer days, you probably don't think about your heating system at all. However, while your oil furnace may keep you warm in harsh temperatures, it's not the best option for your home. Natural gas conversion switches your fuel source from oil to natural gas. And, because the gas conversion process may take up to three months, starting in the summer gives you plenty of time to make the switch before the first frost. You get four significant benefits from this change. The U.S. Energy Information Administration reports the average winter fuel costs for oil heat is $1,392, while natural gas came in substantially lower at $578. Your savings may exceed 50 percent after you go through a gas conversion. 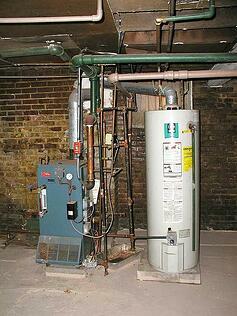 How much time and money do you spend on oil furnace maintenance? You have to stay on top of your oil supply, get the soot cleaned out of the system, pick up new oil filters and keep up with a service contract. However, you won't have to worry about any of that with a natural gas furnace. Natural gas offers an eco-friendly advantage as a clean-burning fossil fuel. The EIA found that gas produces 1.22 pounds of carbon dioxide per kilowatt hour, while oil produces up to 1.76 pounds. Your home generates less pollution so you can live a more eco-friendly life. The oil market fluctuates based on international influences. Your winter heating bill shouldn't be variable based on political pull and the global oil supply. Oil pricing and limited local quantities can quickly put you in a situation where the price increases significantly due to a lack of inventory. In contrast, natural gas comes from domestic sources, so it's readily available with a predictable price. Natural gas brings many benefits, from lower costs to decreased maintenance. More than 60 percent of homes in New York rely on natural gas to get them through the cold weather. You can join them and find out first-hand why so many people prefer this efficient energy source.